The Hawker Siddeley P.1154 was a planned supersonic vertical/short take-off and landing (V/STOL) fighter aircraft designed by Hawker Siddeley Aviation (HSA). Developed alongside the subsonic and smaller Hawker Siddeley P.1127/Kestrel, the P.1154 was derived from the P.1150. The P.1150 proposal did not meet NATO Basic Military Requirement 3 and, consequently, the P.1154 was born. This Mach 2-capable aircraft retained plenum chamber burning previously designed for the P.1150. Although the technical winner of eleven submissions, follow-on testing and production for the P.1154 did not proceed as a result of political strife. Meanwhile, Hawker Siddeley considered modifying the airframe for a joint specification for an aircraft by the RAF and Royal Navy. Between 1961 and 1965 the two services harmonised their specifications to preserve design commonality. However, the RAF's desired configuration was to take precedence over that of the Royal Navy's. A number of proposals were submitted – at one stage, a twin-Spey design was considered, then rejected. Following the Labour government's coming to power the project was cancelled in 1965. The Royal Navy would acquire the McDonnell Douglas F-4 Phantom II, while the RAF continued to foster development of the P.1127 (RAF), leading to the successful Harrier Jump Jet family. In 1961, during the development of the V/STOL P.1127 and Kestrel, HSA considered the feasibility of a supersonic V/STOL aircraft. This was influenced by a general perception at the time that supersonic aircraft held significantly more value than subsonic aircraft. Consequently, on 13 April 1961, HSA decided to conduct preliminary work on a supersonic P.1127 under the guidance of Ralph Hooper. The aircraft, designated P.1150 and 50% larger than the P.1127, would employ plenum chamber burning (PCB) – essentially an afterburner in the previously cold forward nozzles – in the engine. The engine was a Pegasus development named the BS.100, and had four swivelling exhaust nozzles. The front nozzles were equipped with PCB, which uses the same principle as an afterburner, allowing the aircraft to theoretically reach speeds of Mach 1.7–2. The Dassault Mirage IIIV was a rival design to the P.1154. The design effort was initially undertaken to cater for NATO Basic Military Requirement 3 (NBMR-3), which was issued in August 1961. Specifications called for a supersonic V/STOL strike fighter with a combat radius of 460 kilometres (250 nmi). Cruise speed was to be Mach 0.92, with a dash speed of Mach 1.5. The aircraft, with a 910-kilogram (2,000 lb) payload, had to be able to clear a 15-metre (50 ft) obstacle following a 150-metre (500 ft) takeoff roll. However, as requirement specifications changed, the aircraft was considered undersized; subsequent studies confirmed these fears, and so Bristol enlarged the original PCB engine and raised the exhaust heat to increase thrust to 146.8 kN (30,000 lbf). A new larger design emerged, initially named P.1150/3 before being redesignated the P.1154. On 6 December 1961, before the design was submitted to NATO, it was decided that the P.1154 would be developed with the requirements for use by both the RAF and the Royal Navy. In February 1962, the Royal Navy's Admiralty received the aircraft concept with great interest as the Royal Navy was seeking a new interceptor aircraft for their aircraft carriers. 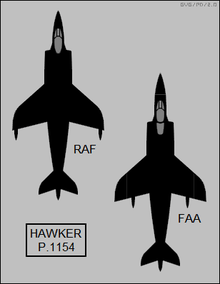 As a single aircraft, the P.1154 would replace Hawker Hunters of the RAF and the de Havilland Sea Vixens of the Fleet Air Arm (FAA). However, the services sought different characteristics in their aircraft – the RAF desired a single-seat fighter with secondary intercept capability, while the Royal Navy wanted a two-seat interceptor capable of secondary low-level strike capability. Although financially and politically committed to a joint requirement with the Royal Navy, the RAF's single-seat design took precedence over the two-seat version of the Royal Navy. However, RAF P.1154s would have to accommodate the Navy's large airborne intercept (AI) radar. When HSA submitted the design on 8 August, the Royal Navy criticised the proposal, which had a tandem undercarriage layout incompatible with catapult operations; consequently, a tricycle undercarriage design was investigated and accepted as practical. In December that year, Rolls-Royce offered a PCB-equipped vectored thrust twin-Spey design as an alternative. This was seen as inferior, however, and was not considered in great detail. The aircraft required PCB for vertical takeoff, but this caused significant ground erosion. The aircraft would have been armed with the Red Top missile. With the RAF and Royal Navy requirements diverging, the aircraft's development started to stumble. While modifications towards naval requirements had been made, by July 1963 weight gain had become a considerable issue, and the Navy was openly criticising the choice of V/STOL. However, despite a stated Navy preference for a swing-wing fighter, on the 16 July 1963 the services agreed that the aircraft would be completely common, with the exception of different radar systems. By August 1963 Hawker Siddeley was expressing the view that range of changes made were damaging the aircraft's potential for export. At the same time, the Navy stated that it regarded the P.1154 as a second-rate interceptor, and the RAF openly decried the loss of strike performance. By October 1963, the MoA was concerned with the project's progress, and noted that the effort to combine a strike aircraft and a fighter in a single aircraft, and trying to fit that same airframe to both of the services, was "unsound". In November 1963, the RAF still found the P.1154 to be a suitable platform, while the Royal Navy appeared to consider the McDonnell Douglas F-4 Phantom II a better fit for its needs. In response, Hawker Siddeley focused its efforts on the RAF version. On 26 February 1964, it was announced in the House of Commons by the Conservative government that a development contract had been placed for the P.1154, equipped with the BS.100 engine, as an RAF strike aircraft. At the same time it was announced that the Naval requirement would be met by Spey-engined Phantoms. More positive news emerged in 1964; on 30 October the BS.100 engine ran for the first time and Hawker Siddeley received favourable reports that the P.1154 was competitive with the performance of other aircraft, including the F-4 Phantom II. Following the P.1154 cancellation, the Royal Navy purchased the F-4 Phantom II. However, on 2 February 1965, the incoming Labour government, led by Harold Wilson, cancelled the P.1154 on the grounds of cost, along with several other aircraft such as the BAC TSR-2 strike aircraft and Hawker Siddeley HS.681 VSTOL transport. At the time of cancellation, at least three prototypes were under construction. [N 2] Following the cancellation, the RAF and Royal Navy adopted the F-4 Phantom II instead, but the government also gave a contract for continued work on the P.1127 (RAF), which led to the Harrier; this name had originally been reserved for the P.1154 should it enter service. In retrospect, aviation author Tony Buttler considered the cancellation of the aircraft to be justified, noting the time consuming and expensive failures of attempts by other nations (such as Soviet/Russia's Yak-41 and West Germany's EWR VJ 101) at a supersonic VTOL aircraft. These aircraft all used a multiple engines configuration like the Mirage IIIV, and not the single vectored thrust turbofan of the likes of the BS.100 and Pegasus which went on to great success in the Harrier. ↑ The Mirage IIIV had been rejected mainly because of its excessive complexity, using nine engines compared to the P.1154's single-engine approach. ↑ Quote:"At Hamble, work began in early January 1965 on jigging the first pair of wings; two more sets were underway by the end." 1 2 3 4 Jenkins 1998, p. 19. 1 2 Wilson 2000, p. 9. 1 2 Buttler 2000, pp. 119–120. ↑ Jefford 2006 et al, p. 12. 1 2 Buttler 2000, p. 118. 1 2 Jenkins 1998, p. 19. 1 2 3 4 5 6 7 8 Buttler 2000, p. 119. ↑ Jefford 2006 et al, pp. 12–13. ↑ Jefford 2006 et al, p. 19. 1 2 Buttler 2000, pp. 118–119. 1 2 3 4 Buttler 2000, p. 120. 1 2 3 4 5 Buttler 2000, p. 121. ↑ Wood 1975, p. 223. ↑ Mason 1992, p. 408. 1 2 3 Wood 1975, p. 252. Buttler, Tony (2000). British Secret Projects: Jet Fighters Since 1950. Hinckley, UK: Midland Publishing. ISBN 1-85780-095-8. Jefford, C.G, ed. (2006). The RAF Harrier Story (PDF). London: Royal Air Force Historical Society. ISBN 0-9530345-2-6. Jenkins, Dennis R (1998). Boeing/BAe Harrier. Warbird Tech. 21. North Branch, Minnesota: Specialty Press. ISBN 1-58007-014-0. Wilson, Stewart (2000). BAe/McDonnell Douglas Harrier. Shrewsbury, UK: Airlife Publishing. ISBN 1-84037-218-4. Wood, Derek (1975). Project Cancelled. London: Macdonald and Jane's. ISBN 0-356-85109-5.